Holy balls. I have not been able to keep up with my life lately. I have been on the go for the past month straight and don’t see any signs of slowing down soon. The combination of backpacking every weekend, work, dealing with a remodel of my condo in-progress, and starting marathon training, have left me feeling like this summer is going by way too fast. But to be honest, I wouldn’t want it any other way. It has been so much fun! Let me share my most recent fun adventure, backpacking in the Stanislaus National Forest to Bear Lake this past weekend. I was fortunate enough to be invited to tag along on one of my friend’s annual family backpacking trips. Every year they get together (dad, sisters, cousins) and go to one of many cool spots they have found over the years. How cool is that?! This year, they decided to go to a beautiful mountain lake they had been to a few times before, Bear Lake in the Stanislaus National Forest. From Lake Tahoe, it is about a 4 hour drive, but definitely worth it. You head South on Hwy 395 and turn West at Sonora Pass Road (Hwy 108). From there, you follow the road for 49 miles until you pass through the tiny little town of Strawberry. After Strawberry, continue to follow the road for about 1 mile until you reach the ranger station. 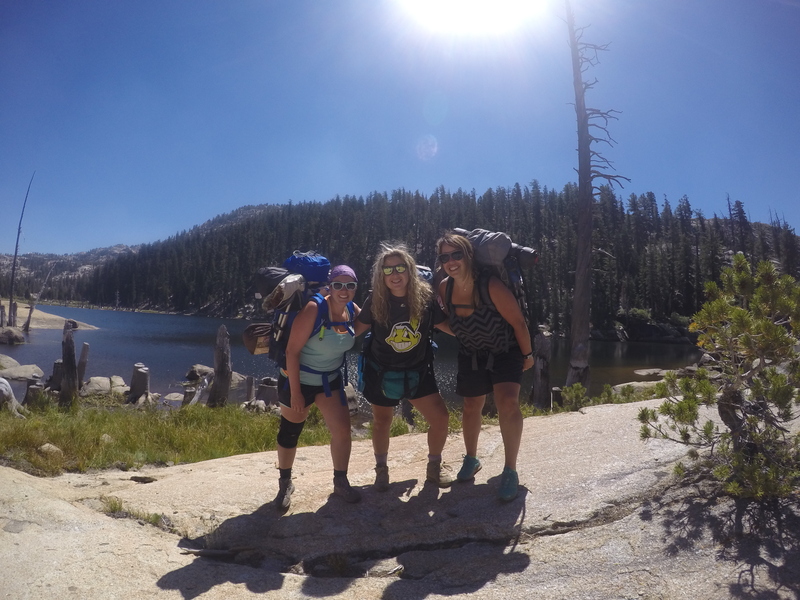 Backpacking permits are free, but you will need to check-in and let them know where you plan on camping (hint: you can only stay one night at each lake, wink, wink). After we had our permits in hand, we drove to the Crabtree trailhead. To get there, continue following Sonora Pass Road for a couple of miles and turn left on Crabtree Road. From there, you will drive about 2 miles and pass a pack horse station on the left. The road turns to gravel/dirt/washboard for a few miles and you will reach a junction. Follow the road to the right for another mile and you will arrive at the trailhead. Once you’re parked, use the restrooms and get some water, as this will be your last chance after you enter the wilderness (there is no filterable water until you reach the first lake in 2.5 miles). The first part of the hike is moderate with a few steep uphill sections. After about 2 miles, it eases up and is a breezy half mile to the first lake, Camp Lake. This is a gorgeous little lake with lots of granite rocks and wildflowers abound. We kept on the trail from here around the side of the lake and went 1.5 miles further to Bear Lake. The hike to Bear Lake is full of wildflowers and beautiful terrain. At one point, my friend Jenn and I said to each other, “we are in a wonderland and there is no way to capture this on film or in words.” Being this late in the season, we were absolutely amazed at how many flowers were still in bloom and how completely breathtaking it was. I literally had to pick my mouth up off of the trail. It is beautiful! You will also pass a couple of lily ponds (AKA mosquito breeding havens) on your way to Bear Lake. I wouldn’t check them out for too long, for fear of being eaten alive, but they are still pretty. After we made our way to Bear Lake, we found a great campsite to the right that had good shelter and was still relatively close to the water. We set-up camp and had a blast for the rest of the trip. 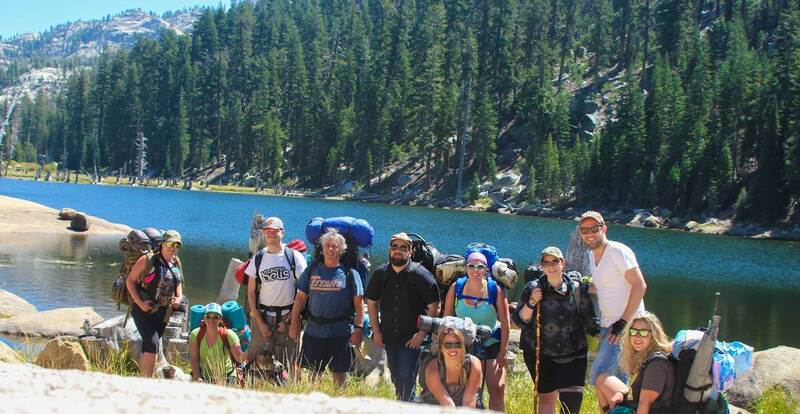 Some in our group choose to take a day-hike to Granite Lake the next day, but the rest of us inflated the floaties we brought, lathered on the sunscreen, and spent the day cliff jumping and exploring the lake. It was one of those days that you will remember forever and I was so fortunate to share it with such a fun, good group of individuals. I also have to say that this group knew how to backpack in style. For dinner the first night, we had chicken fajitas (don’t hate on the flour tortillas all you paleo people) and the second night we had hot dogs. The past two weekends have been nothing but dehydrated crap, so it was awesome to eat some real food out there. We may have also brought along some Fireball, boxed wine, and Cards Against Humanity. Late nights and fun times to be had by all. It is times like these that I feel like I am really living. Experiencing adventures and creating memories with friends and new acquaintances is what life is all about. I look back at where I was this time last year, and it has been such an amazing journey. This time last year, my wound was still fresh from a breakup with a long-term, dead-end boyfriend, I wasn’t taking care of my health, and I was feeling sorry for myself that I didn’t get to go do more cool things. Over the past year, I have learned to love myself and do all the amazing things I want to. I know it sounds cliche, but your parents were right. You can be anything you want to be. That might not be a celebrity or a millionaire, but YOU have the power to make yourself into the person you want to be. Think about it. I mean, really think about it. Do you want to go backpacking and experience the outdoors? Make it happen. Do you want to run a marathon? Make it happen. Do you want to eat healthier? Make it happen. What are some of the things that you want to do but feel like you don’t know where to start? The crew at Bear Lake.